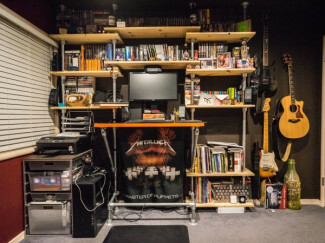 A few years back, Chris built a sitting desk for the office in his home. 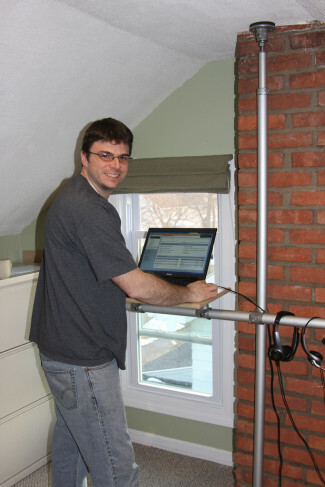 However, in doing so he was inspired to build a standing desk that could be placed on top of his existing desk. Both designs utilize Kee Klamp fittings and pipe to complete the desk frame which were then paired with custom table tops crafted from poplar plywood. 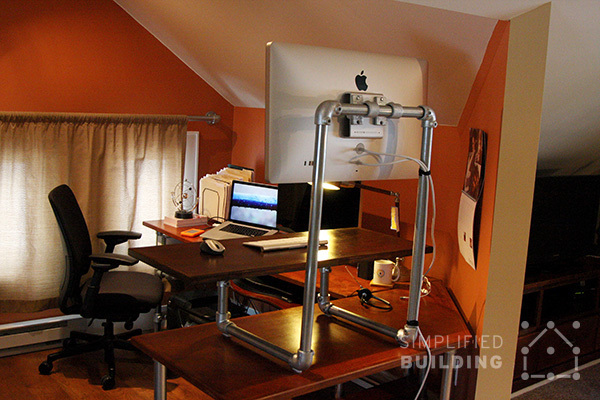 For the standing desk converter, Chris drew inspiration from a similar desk featured on the Simplified Building blog. 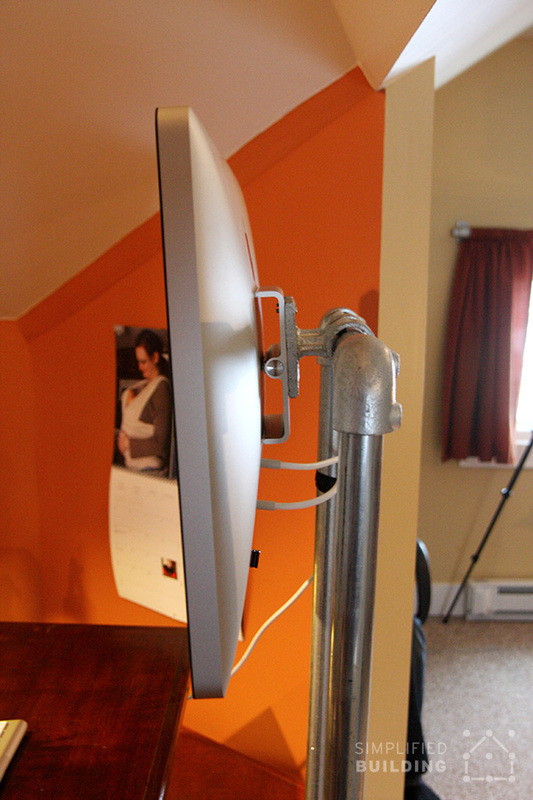 To attach the computer monitor, Chris utilized Kee Klamp Rail Support fittings in combination with a VESA mounting bracket. 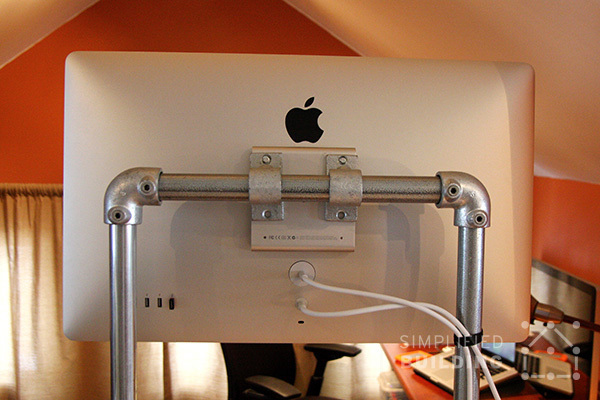 The Rail Support fittings slide onto the pipe at the top of the frame and mount to the bracket already secured to the computer monitor. 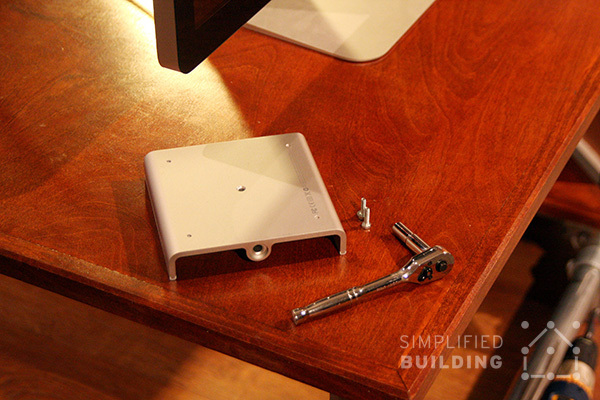 In the image directly above and below, we see a closer look at the VESA bracket Chris used to attach the monitor to the Rail Support fittings connected to the desk frame. 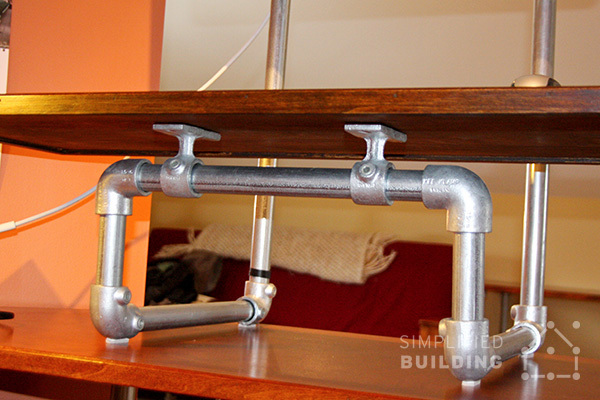 To attach the desk table top, Chris again utilized the Rail Support fittings. The table top sits flush on the flange end of the Rail Support fittings, and two holes in each of the fittings, allowed Chris to mount the table top. 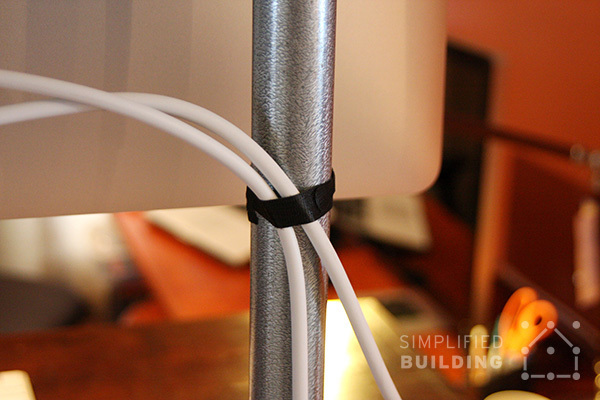 Finally, to keep everything neat and organized, Chris used simple Velcro wraps to secure the computer monitor cables to the desk frame. 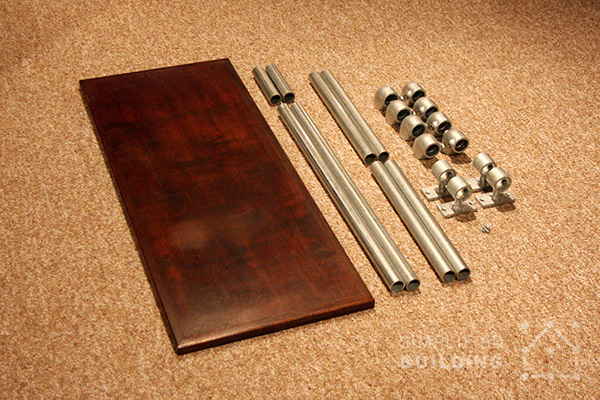 Below, are the fittings and pipe you will need to assemble the desk frame. Keep in mind that the dimensions of the frame are 100% up to you and configurable based on your chosen application. 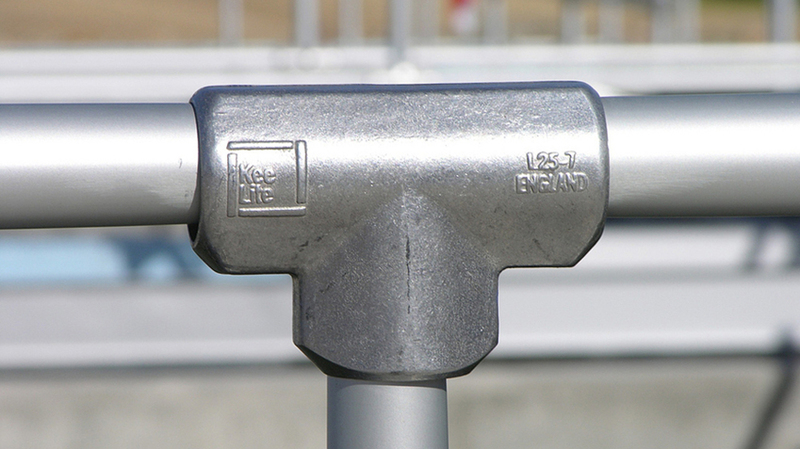 15-5 - 90° Elbow, 3/4"
70-5 - Rail Support, 3/4"
Pipe. The pipe can be any dimensions you like. In Chris' design, the horizontal pieces are roughly 2' long. The longer vertical pieces are about 3' and the shorter pieces about 6 to 8". To assemble the desk, we recommend building the desk frame in sections which can then be joined together. First, start by assembling each of the "side" sections. 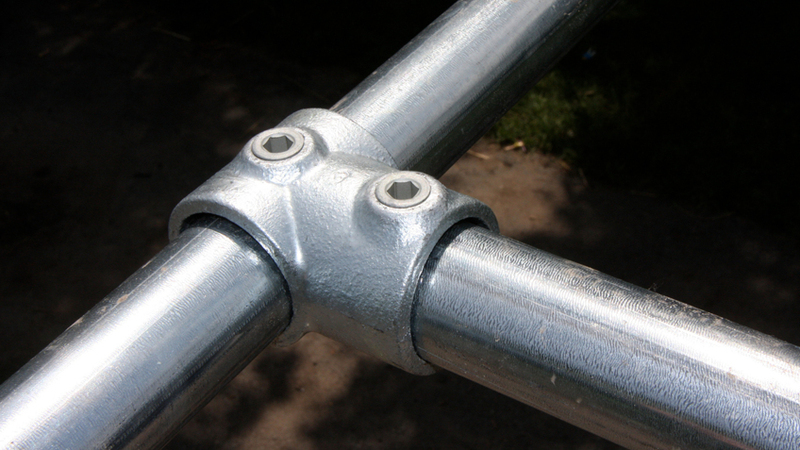 Each "side" section will utilize four 90 Degree Elbow fittings. Follow the illustration in Step 1 to assemble the first section. Then, repeat this process until you have two sections as pictured in Step 2. From there, you can join these two sections together to complete the frame. Follow the diagram in Step 3 to join the sections. 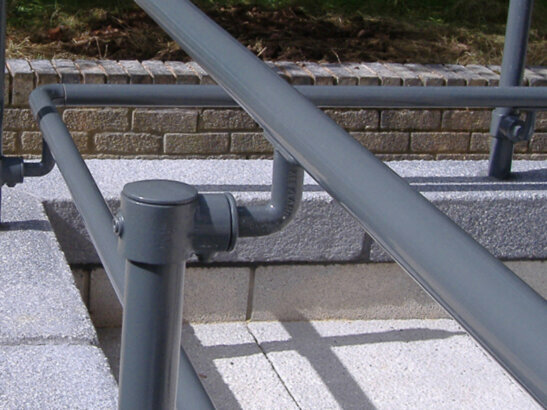 Don't forget to slide two Rail Support fittings onto each of the horizontal pieces before connecting the sections together. The desk frame should be complete as pictured in Step 4. 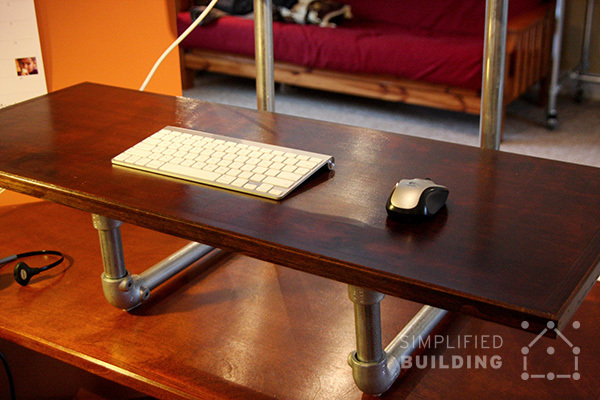 Now, you can attach the desk table top. Place the table top over the Rail Support fittings at the base of the frame. 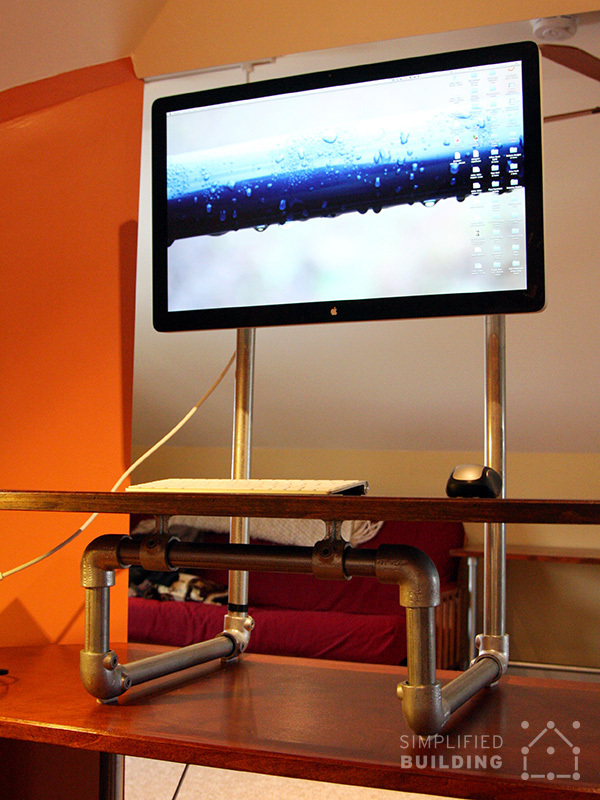 Then, using the appropriate hardware, mount the table top to the fittings. There will be two holes in the flange section of each of the Rail Support fittings. These can be used to mount the table top. The diagram in Step 6 shows a closer look at the Rail Support fitting. Now, you can attach the computer monitor. You will need to use a VESA bracket attached to the monitor and that bracket can be attached to the Rail Support fittings. That's it! 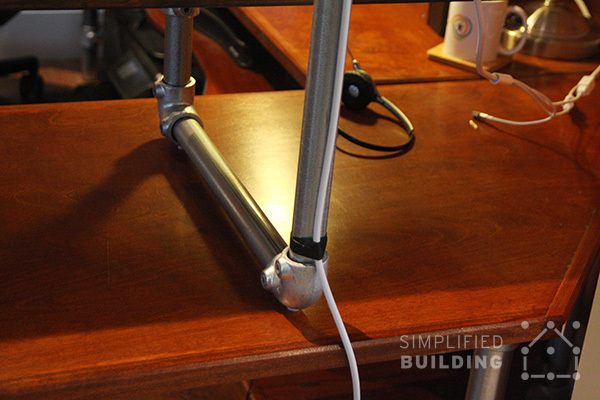 You should now have a complete standing desk converter to place on top of your existing, sitting desk. 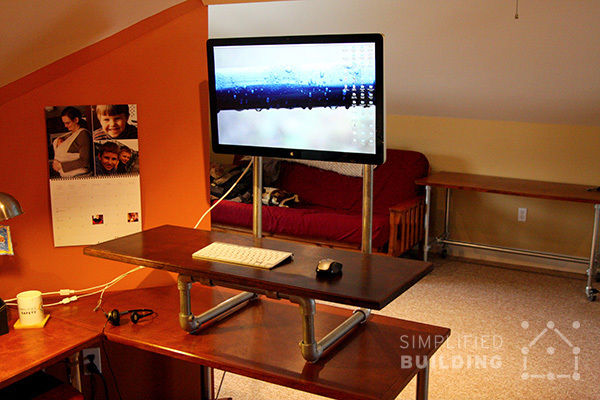 If you have any trouble assembling the desk frame, please don't hesitate to reach out to our projects team for help, either by email (projects@simplifiedbuilding.com) or using the form on our free design assistance page. We are happy to assist you in your project. From helping you bring your design to life, to answering any questions you have, we've got you covered. Finally, if you like the look of Chris' desk but would rather have a regular standing desk, try browsing our desk frame kits to see if there is a fit for you.